Garmin is well known for pioneering modern GPS technology and providing solid navigation systems. But as smartphones took over the GPS industry, it was time to move on. 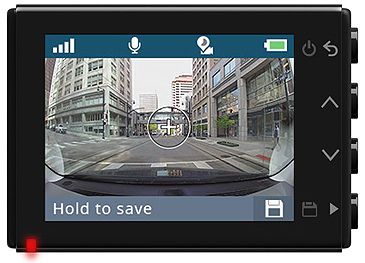 Dash cams are more popular than ever and have become a necessity in many parts of the world. This is why Garmin has released the 65W, a modern and unique dash cam that does much more than simply cash in on the industry. Open up the box and you’ll find everything you need to get started. This includes a USB and power cable, a magnetic mount and quick start manual along with the camera itself. An SD card for storage is also included, which is rather rare at any price point when it comes to dash cams. You can also pick up a variety of extra accessories for the 65W, including a high speed cigarette multi charger, a Cyclops safety camera subscription and a 13 foot vehicle power cable. The 65W sports a fairly minimal and subsequently attractive design. The compact build is encased in a matte black polycarbonate shell, with a textured accent on one half of the front piece. You’ll also find the camera lens on the front, with a clean, unibody build finished with a metallic bronze lining around the end, giving the camera a premium look. Flip it over and you’ll find the display coupled with some graphics to detail what the navigation keys on the right side do, allowing you to configure the camera on the go. On the left side you’ll find the charging port, which the USB cable neatly plugs into at an angle, further pushing the clean and modern aesthetic. Up top you’ll find the port which the included mount clips onto. One of the 65W’s main selling features is the 180 degree wide angle lens, which helps the camera see cross-traffic and multi-lane highways much easier. The 2.1 megapixel camera is capable of recording video in 1080p and features a high aperture that helps it record clearer images in low light conditions. Overall, images are crisp and smooth, small details such as number plates and road signs can easily be made out at a distance and glare from bright lights and sunshine is well suppressed thanks to the polarized lens. The compact build and black paint job help the 65W remain fairly discrete, although you may want to cover the gold lens lining to further improve the effect. While nothing specific is mentioned in terms of temperature management, many customers living in hot areas report that the camera runs smoothly even when exposed to direct sunlight and higher temperatures. If you’re still skeptical, simply point an air conditioner vent towards your dashboard to help keep things cool. The camera also features a variety of safety features. 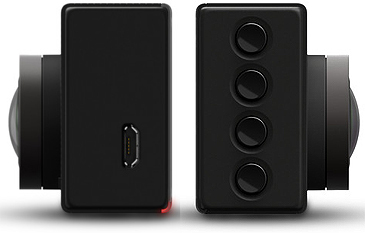 This includes a G-sensor which will automatically save and lock footage when it detects a collision. This incident detection feature utilizes GPS to store where the accident took place as well, something most dash cams don’t do due to a lack of included GPS technology. Stored information includes coordinates, date, time, speed and direction of travel. Forward collision warning ensures that you aren’t driving too close to the vehicle ahead while lane departure warning stops you from hitting a vehicle that you didn’t see before changing lanes. If you choose to purchase the Cyclops subscription, you can also receive alerts on red traffic lights and speed cameras. There are numerous other features such as the “Go” feature which alerts you when traffic has started moving after a stop at an intersection. If you have the parking mode cable accessory, you can monitor your vehicle’s surroundings while the engine isn’t running. The camera will automatically record footage only when motion is detected, saving storage space in the process. If you want to save storage space on the go, you have two options. The first is traditional loop recording, found on most dash cams. The second is Travelapse, which is Garmin’s version of loop recording. This condenses hours of footage into minutes of highlights, allowing you to share travel movies or long road trips without making your audience fall asleep. 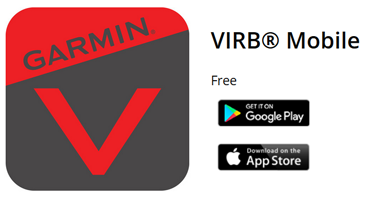 The 65W is compatible with Garmin’s VIRB mobile app, opening up a plethora of features and opportunities. This includes wireless synchronisation with your smartphone through the app, negating the need to transfer data via cables or microSD cards. This makes it easier to share videos with friends, police and insurance agencies. If you don’t want to install the app, you can easily playback footage on the built-in display instead. Here you can also configure settings using the built in navigation keys, or simply use the voice command feature for a hands-free solution. 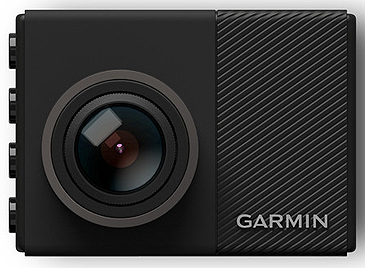 The keyword is “Ok Garmin,” which enables the 65W’s microphone, allowing you to command it to save a video, take a picture, enable audio recording and the Travelapse feature. By default, storage is handled by the included microSD card. But you can pick up a larger one if you require more footage to be recorded in one session or simply less maintenance. Luckily the 65W supports up to 64GB of storage provided the card is a class 10 or above, as faster read/write speeds are necessary for higher end dash cams to operate without stuttering. Video quality settings and numerous other recording options can be configured through the VIRB app or on the camera itself using the navigation keys. Lowering the resolution could significantly reduce your storage usage, allowing you to record more footage without having to do maintenance as often. 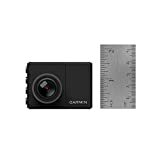 Garmin has done a great job including as many safety feature as possible on the 65W, which is likely one of the most important aspects to focus on, as dash cams are built for safety. Having peace of mind that you’ll have proof when involved in an accident that wasn’t your fault is essential these days and extra features such as forward collision and lane departure warnings are an appreciable cherry on top. Whether you’re looking for a modern, advanced camera to add to your arsenal or you’re simply a new driver looking for extra security, the 65W is a solid choice.